In 2006, the Diocese of Scranton hired Meitler Consultants to conduct a study of the diocesan Catholic school system. In November of 2007, the firm presented a draft proposal for the reconfiguration of diocesan schools. This plan called for the closure of Bishop O’Reilly, along with four other high schools in Luzerne County, in order to create one new merged high school at the Bishop Hoban campus in Wilkes-Barre. Nearly 500 concerned Bishop O’Reilly parents, alumni, and friends soon met to draft a counter proposal that offered a feasible, financially sound alternative to closing O’Reilly. 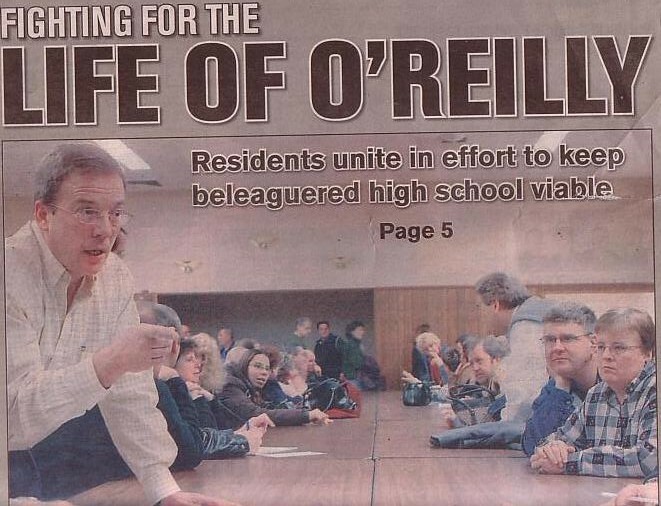 The group’s sincerity, determination, and manner were a testament to the strong O’Reilly tradition and values. Unfortunately, after hours of hard work, the Bishop Joseph F. Martino and the Meitler firm wholly rejected all counter-proposals. Bishop O’Reilly closed it’s doors in June of 2007 and has since been converted into a regional elementary school, Good Shepherd Academy. Most underclassmen transferred to the new Holy Redeemer High School in Wilkes-Barre. Today, the O’Reilly tradition lives on through its thousands of successful alumni. The educational legacy at 316 North Maple Avenue continues through Good Shepherd Academy, a regional elemntary school, as well as at the consolidated Catholic high school, Holy Redeemer, in Wilkes-Barre. Ours to be your champion to guard with your mighty shield, to bear our noble standards in our chosen field. Loyalty, love an honor these the debts we owe to you, hail to our high school–forever Gold and Blue.